There are some recipes that are so essential to individual families’ holidays that the thought of doing Christmas without them is just unfathomable. In Elizabeth’s family, that recipe is for Olive Cheese Balls — little puffs of cheesy shortbread wrapped around green pimento-stuffed olives. Elizabeth’s mom always made them for her annual Boxing Day party and now Elizabeth makes them for her own early December open house to kick off the season. 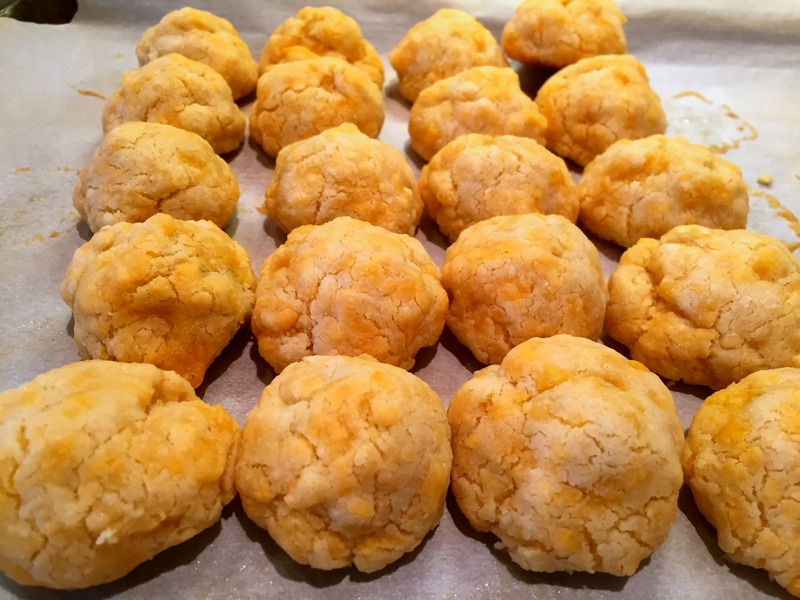 These were a staple in the ’70s (when Elizabeth’s mom would have first discovered them) — there is indeed a version called Olive Cheese Balls in the very first Best of Bridge cookbook. The original ladies called them Olive Cheese Puffs and suggested using gherkins or cocktail onions in place of the olives and spicing things up with a half teaspoon of paprika (a little bit of cayenne would also work). Whichever way you go, these freeze beautifully — freeze them after they’ve been fully baked and then reheat them until the dough softens up and the olives inside are warm. Stir cheese and flour together (with the paprika if using) in a large bowl. Slowly pour in the butter, working it through until a moist dough forms. Mold 1 tsp of dough around each olive and place 2 inches apart on a parchment-lined baking sheet. Heat oven to 400F. Bake for 15 to 20 minutes or until the bottom of each ball is just lightly browned. Posted in Appetizers, Dips & Sauces. These are so good – truly addictive!